What's a Rocker? 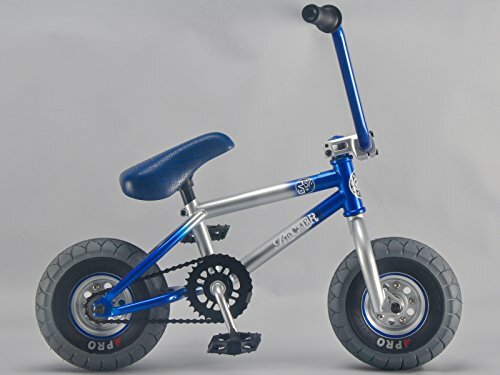 Rockers are chunky mini versions of 20" BMX bikes designed to take a serious amount of adult sized abuse. Fat tyres, massive bars, top load stems every bit as RAD as a 20". With a generous selection of colours to choose from + some rare LTD edition models, Rockers are very collectible. Rocker IROK. The Rocker IROK is the best compromise of affordability, performance & quality for those starting out in miniBMX. It's RAD, fast rolling, adult proof and features many quality Taiwanese BMX components you won't find on other so called 'mini BMX's. IROK's are about having a blast with your mates and are clearly recognised and accepted as a global extreme & fun sport that's here to stay! It's likely you have seen dudes shredding IROK's at your local park & wondered, ''where can I get one''??? Well you can get one here, direct from the manufacturer! Specification New light-weight Hi tensile steel frame / forks with short back end Front load stem with forged face plate Thread-less forks 10" x 28" bars Plastic BMX pedals Kraton rubber grips 30/13 gearing (for high speeds - up to 15 mph) Sealed cartridge wheel bearings 1 piece hi ten forged steel cranks USA BB Fat padded seat Brand new design 5 bolt steel 2 piece wheels with very loud freewheel (new wheels roll much faster than the previous Rocker wheels for higher speed on ramps or just chilling, while being much stronger) New Street Pro Style Tyres Colour matched KMC chain Weight 9.5 kg (20.9 lbs) a saving of 3.3 lbs on the original Rocker Important: Rocker is the British brand that started the mini BMX revolution and continues to develop & innovate the sport at the top level. Buying substandard copies often results in pain and misery. Extreme sports product suitable for use by persons 12 and over but under 90 kg. If you have any questions about this product by Rocker BMX, contact us by completing and submitting the form below. If you are looking for a specif part number, please include it with your message.